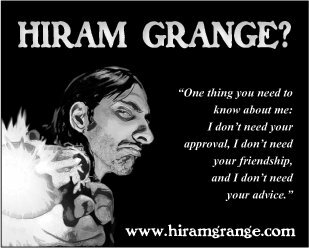 Here’s the second in a brief series of articles about the creation of the Hiram Grange novellas, currently being released by Shroud Publishing, and due to conclude in April with my own ‘Hiram Grange and the Nymphs of Krakow’. You can find part one here, in which Tim from Shroud Publishing makes mysterious utterings, and lures five writers to him. Having summoned us to the online equivalent of a darkened room, quietly locking the door when the last of us was in, Tim unveiled his notion. Five novellas, each twenty-thousand words long, about Hiram Grange. A man who fights monsters, but who is also a monster. A scarred, sneering relic, brutally efficient, more than a little misogynistic. The stories were to be classic pulp fiction, brought bang up to date. We stared at him for a little bit, in an online, metaphorical sort of a way. And then we all started to talk at once. Loudly, and with some waving of arms. Ideas flew around, steaming hot. A lot was nailed down, very quickly. One of the first contributions I made was that the series be properly serial, with each standalone story containing hints of a bigger picture that would play across the five books, and conclude in the last. As a reader, I love that sort of double engagement with a story – it rewards investment, and has you drumming your fingers waiting for the next part to arrive – and was delighted when the idea was embraced. We spent a few days emailing constantly – questions and questions and questions. Who does Hiram work for? Who are his friends? Where does he live? Is he really a borderline alcoholic and habitual drug user? Were we telling a story that was essentially static, so that the status quo was retained at the end of book five, or were we prepared to set up Hiram’s world, and then explode it around him, ready for something new if the books did well enough for us to take things further forward? How heroic a hero is he? What does he wear? How did his parents die? Why is one chamber of his Webley filled with a spent shell? How do confluences actually work? Who is his real nemesis, and how much do we unveil about him/her in the series? We agreed, we argued, we nicked each others ideas, changing them and throwing them back into the pot so that somebody else could do the same thing again. We slaughtered each others babies mercilessly, leaving room for better ones to be born. Not the most humane metaphor for the writing process, but better than the usual triteness about nurturing a story like a child and watching it grow, etc. I always find it more like a cull, followed by the brutal conditioning of and enforced surgery on any survivors, until you’ve one left that you think you can live with. That’s how it works for me, and definitely how I viewed the creation of Mr Grange. It was bloody exhausting, but extremely exciting. By the end, we had something to take forward, a world and a man we thought we could tell thrilling stories about. That’s when we went away into our own little worlds, to make his stories our own. In a month or so, I’ll tell you about Poland, and the Beast of the Air, and the horrors of continuity, and how we infected each others stories so that each book has a little bit of all of us in it. In the meantime, for more Hiram you can check out an interview with him, currently running at Choate Road. You don’t often see your characters interviewed, so this was interesting. You can also check out this review of Hiram Grange and the Twelve Little Hitlers, Scott Christian Carr’s brutal and twisted second entry in the series (how can you not love the title?). And of course, you can go to Amazon and buy the first two books. Just tap “Hiram Grange” into the search box, and get ready for a ride.